Writing has not always been available for the "common person" to utilize. In the past it was restricted only to the few who were educated especially for that purpose either as scribes or monks who dedicated their lives to this vocation. You can learn more about the ancient Egyptian scribes by clicking on the link at the bottom of this page. 2. Added in a postscript. 1. To officially follow a doctor's instructions for a patient to follow a particular course of medical treatment: Jim's doctor prescribed a medicine that has details of how often the drug must be taken, how much is to be consumed, and any other relevant information for him to follow. 2. 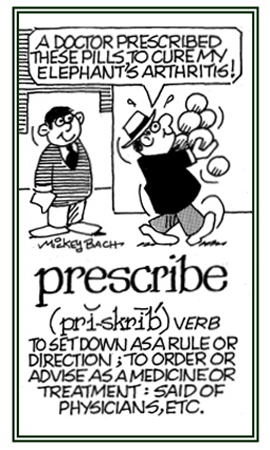 To present rules or instructions that are to be followed exactly as presented: Mark's new employer prescribes that new workers must pass a physical examination before they can become employees or members of the company. 3. To do something that is suggested as a way to accomplish or to make an objective or an intention succeed as desired: A parent's group is prescribing the improvement of the educational system in their community. 4. Etymology: from Latin praescribere, "to write before or in front, to order, to direct" from prae-, "before" + scribere, "to write." © ALL rights are reserved. Laid down, appointed, or fixed beforehand; ordained, appointed, set, fixed, defined. 1. Someone who indicates something as a guide, direction, or rule of action; to specify with authority. 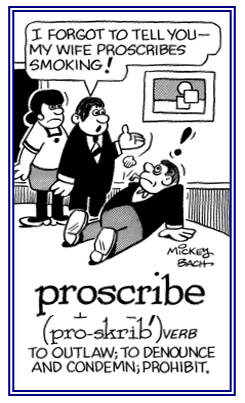 2: To designate, or to order, the use of as a remedy. 1. A rule, or regulation, that has been laid down; usually, in writing. 2. 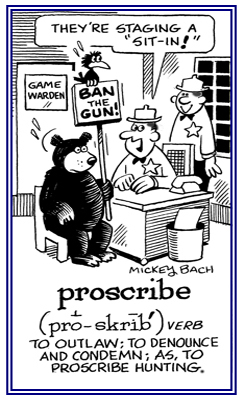 Something prescribed; especially, a rule, or regulation, of conduct. 1. A written order issued by a physician or other qualified practitioner that authorizes a pharmacist to supply a particular medication for a particular patient, with instructions on its use. 2. A written order from an optometrist or ophthalmologist for glasses or contact lenses of a particular type and strength to correct the eyesight of a particular person. 3. A proven formula for causing something else to happen. 4. Laying down of laws, rules, and regulations. 1. Establishing or adhering to rules and regulations. 2. Based on legal prescription. 3. Based on, or authorized by, long-standing custom. 1. Sanctioned or authorized by long-standing custom or usage. 2. Relating to the making or giving of injunctions, directions, laws, or rules. 1. That which is able to be denounced or condemned as being dangerous or harmful; prohibitive. 2. Anything that can be put outside the protection of the law; outlawed. 1. To remove from the protection of the law or rules, to outlaw: Strikes by military personnel have always been and are still proscribed or forbidden. The school administration proscribed, or did not allow, the use of cell phones in its classes. 2. To reject, to condemn, or to denounce something as useless or dangerous; to prohibit, to interdict: There are more and more public places that are proscribing smoking which is much more healthy for everyone. 3. To banish or to expel from a country, community, or group: The illegal alien was proscribed back to his native country. 4. Etymology: from Latin proscribere, "to publish in writing, to condemn" from pro-, "before" + scribere, "to write." © ALL rights are reserved. 1. Someone who dooms something to destruction. 2. Anyone who denounces a person, or situation, as dangerous, or as utterly unworthy of reception. 3. A person who condemns or forbids something, or someone, as being harmful or unlawful. 1. An act of condemning or forbidding something. 2. The condition of having been denounced or exiled. He who writes reads twice. A suggestion that it is a good idea to write out something that one wishes to learn thoroughly. There is a special presentation about the history of the ancient scribes at this "Professional-Egyptian scribe story", Part 1. Related "writing" units: glypto-; gram-; graph-. Showing page 4 out of 7 pages of 101 main-word entries or main-word-entry groups.